Neuschwanstein Castle (German: Schloss Neuschwanstein) is a 19th-century Romanesque Revival palace on a rugged hill above the village of Hohenschwangau near Füssen in southwest Bavaria, Germany. The palace was commissioned by Ludwig II of Bavaria as a retreat and as a homage to Richard Wagner. 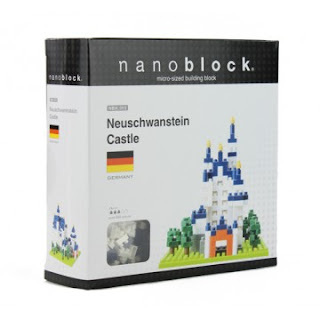 The nanoblock Neuschwanstein Castle set comes in a small box packaging, with over 550+ pieces of building blocks, and a sheet of instruction paper to show you how to build this castle. This is a "Level 3" nanoblock set. It is not difficult to put together, but you will need some patience as there are a lot of tiny bricks involved. It took me around 50 minutes to build this. The build process is quite straight forward, but do pay close attention to the instructions, as there are many steps involved, and some of the steps seem quite similar, so there is possibility of getting confused. Here are some pics of the build process. The finished castle and the leftover bricks. And here is the final result. This nanoblock Neuschwanstein Castle is about 9cm high at the tallest point. It is quite an amazingly accurate model of the real thing given the small size of this nanoblock model. 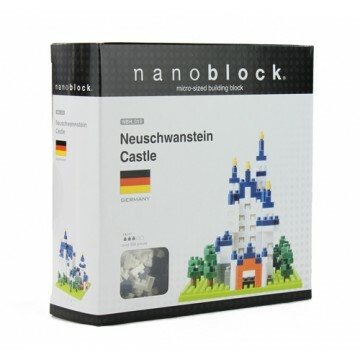 This nanoblock Neuschwanstein Castle set retails at RM69.90, and you can get them from many Toys R Us, Action City, Kinokuniya, Popular Bookshop and XL Shop in Malaysia now. You can also find it in my Amazon.com store.